A law firm in Newcastle has expanded its medical negligence team with the addition of three new lawyers. Burnetts has recruited two new solicitors and a paralegal into its medical negligence team in Newcastle. The specialist team, which is headed by nationally recognised solicitor Angela Curran, now includes two qualified nurses. Associate Solicitor Mark Johnson (54) was previously with David Gray Solicitors and will be focussed on helping to grow the firm’s North East client-base. Law is Mark’s second career: he was a specialist intensive care nurse at Newcastle Freeman Hospital for more than a decade and remains a registered nurse. As well as being a member of the Royal College of Nursing, he is also in the Musicians’ Union. He lives in Newcastle. Hannah Fitzpatrick (28) joins the team as a Solicitor from the personal injury team of Winn Solicitors. Efficient and organised, she has more than five years’ experience working in litigation and managing a challenging case load. Hannah’s role at Burnetts will involve providing support to Angela Curran and her clients, most of whom are children who have suffered serious birth trauma. Hannah lives in North Shields and is currently in training for her first marathon. Stephanie Long (32) from Gateshead joins Burnetts as a Nursing Paralegal. A qualified Nurse Practitioner, Stephanie has worked at hospital trusts throughout the North East. At Burnetts she is the first point of contact for new client enquiries and responsible for assembling, summarising and evaluating medical records. Stephanie is a great lover of animals with two dogs, two cats and a horse. In total Burnetts’ medical negligence team is 13-strong including: four Partners, two Associate Solicitors, three Assistant Solicitors, a Legal Executive specialising in Court of Protection, a Nursing Paralegal, a Costs Adviser and a Legal Assistant. More information about the Newcastle team can be found at http://www.burnetts.co.uk/newcastle . 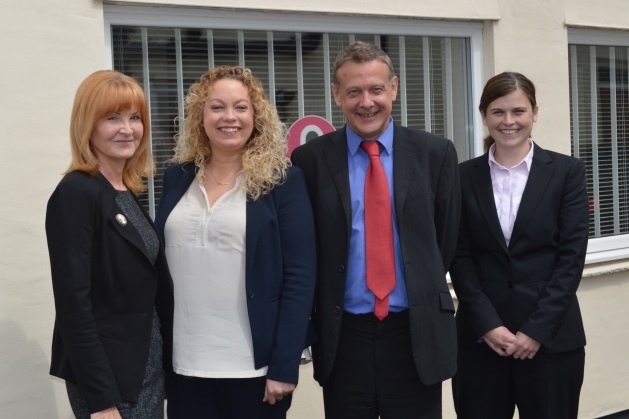 Pictured left to right: Angela Curran, Stephanie Long, Mark Johnson and Hannah Fitzpatrick.